Barrie Colts acquire Kirill Nizhnikov from Mississauga Steelheads. #OHL - Very Barrie Colts | A website covering the Barrie Colts of the OHL. The Barrie Colts have traded some draft picks in exchange for Kirill Nizhnikov from the Mississauga Steelheads. 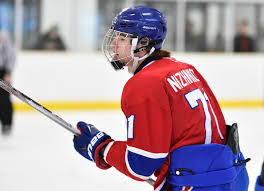 Mississauga picked up Kirill 7th overall pick in the 2016 OHL Priority Selection. As soon as we get word of what picks the Colts included in the deal we will be sure to update this post. Though, neither team has made mention of the deal yet but we were given word of the news from our good friend Sebastian from overtimesportsnation.com. The right winger pent last season with the Toronto Jr. Canadiens of the GTMMHL. There he posted 23 goals and 14 assists in 27 games. He also managed to post 3 goals and 5 assists in 6 games played at the OHL Cup. It seems this deal took some work and now it is just a matter of seeing if the Colts are able to sign him which appears to have been the problem in Mississauga. We would like to welcome Kirill to the Barrie Colts!